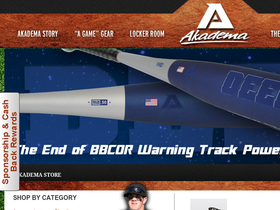 Akadema, online at AkademaPro.com, is the ultimate source for the most innovative baseball and softball equipment. This store offers supplies for professional, college, high school, serious youth players, and more. Plus, Akadema differs from other baseball sporting good companies because the gear is made with the knowledge of creators who actually play the game. Shop a variety of products such as apparel, bats, catcher's gear, eyewear, footwear, gloves, etc. Find Akadema coupons, Akadema.com codes, and Akadema promotions at RetailSteal.com, so stop by before you shop. See website for information regarding shipping. Rates may vary. Shop online at Akadema today and save up to 65% on sale apparel. Click the link to check out the selection. Shop the monthly specials at Akadema today and save up to 75%. Click here. Find the lowest prices around on bats when you shop at Akadema today. Act now and purchase American made bats for as low as $26.99. Shop apparel starting at only $9.99 when you shop Akadema today. Click our link to head over now.